Synapse Conference Tables feature recessed power modules so your team can stay charged up during longer meetings or presentations. Choose from eleven finishes, four shapes, and more. Standing meetings are quicker and more productive—with Synapse, your whole team can stand together. 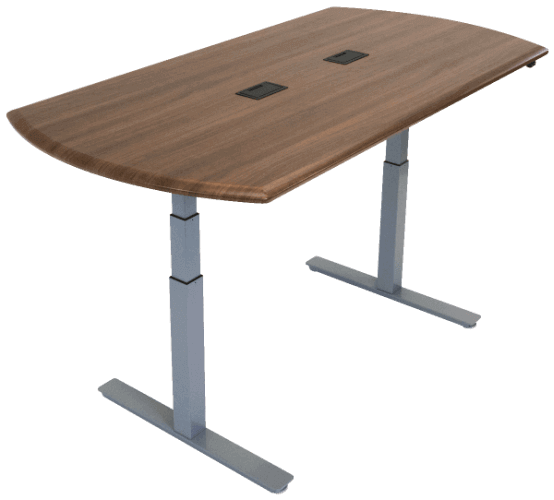 Choose the Multi-Purpose for a standard tabletop, or the Conference with two recessed power modules. Both tables are powered by the premium Vigor base, with a whopping 490 lbs of lift capacity. The icing on the cake? Synapse tables require practically no assembly—just insert four screws and you're done. Outside the office, Synapse shines as a large, adjustable-height work surface that can be used for a variety of purposes, from arts & crafts to dining to studio.